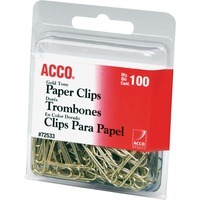 Smooth, gold tone paper clips. Durable gold finish adds a professional, upscale look to documents and maintains shine over time. Ten sheet capacity in 2 size. 100 paper clips per pack.